MSI unveiled a unique new feature it is introducing with its next-generation socket LGA1151 motherboards, called the M.2 Shield. This is an aluminium heatspreader that acts as a full-length cover over the motherboard's M.2-2280 slots, hinged near the M.2 interface. The heatspreader has non-conductive thermal padding on the inside, letting it make contact with the drive's hot components (controller, NAND-flash chips, etc), and pushing heat over to the heatspreader. 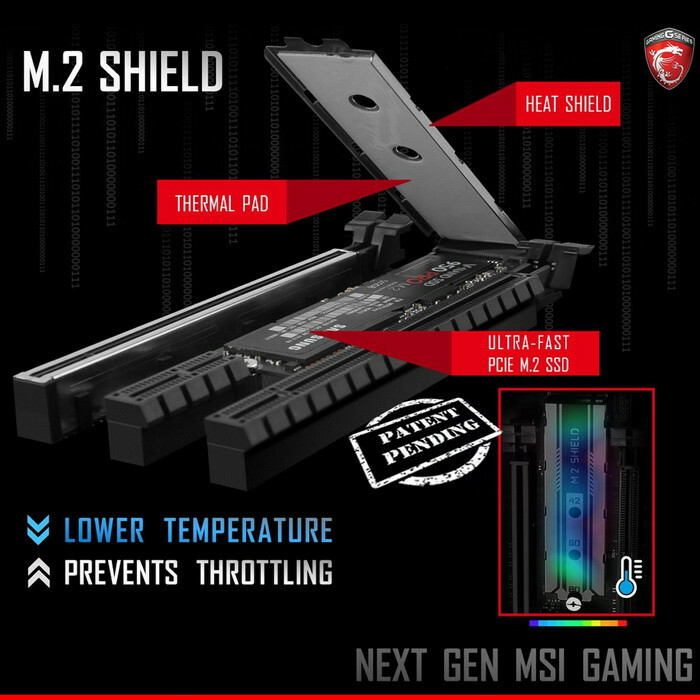 MSI claims that this lowers temperatures, and reduces throttling on some of the high-performance M.2 PCIe SSDs. Some of the faster M.2 SSDs such as the Samsung 950 Pro have indeed earned the notoriety of heating up to levels that reduce performance. It remains to be seen how much a thin sheet of aluminium changes that. I think you need to put on your glasses, click on the picture and read the text. It very clearly states that it come with a thermal pad. I smell liquid cooled m.2 SSD in the short coming years. Well, it's a great idea if for no other reason than it will cover up those nasty little green SSD PCB's , which can ruin the aesthetic look on colour coded builds. That could be very useful feature addition. How much do they heat up? Is heat an actual issue or just marketing BS? "Until a few weeks ago, I would have doubted that a thin aluminum heatsink could make a dent in the temperature of a high-performance SSD. After testing the new Plextor M8Pe(G) M.2 SSD with a heatsink, though, it's become clear that a thin heatsink with a thick thermal transfer material pad can lower temperatures, but it still requires air flow to be effective." Those SSDs generate roughly 2-3W tops, so it's almost definitely some marketing BS. Could still help a little in terms of aesthetics tho. Air flow is all that's needed, heat spreader and a heat shield seems kinda counter productive are you dissipating the heat or reflecting heat away. Mostly marketing BS if you are sustaining reads and writes at 100%throughput for 30+ second your computer is broken or you are running synthetic benchmarks. Cheaper drives probably won't though, so it's still nice to have the motherboard take care of cooling the SSDs. Lots of comments from people that don't even seem to own an M.2 drive. I can tell you that my Plextor M8PeG gets very hot in certain circumstances and that's with a heat spreader. I guess it doesn't help that it sits between the graphics card and CPU, which isn't exactly the coolest area of the motherboard, but that's where most manufacturers seems to put at least one slot. Ideally I'd like to see motherboard manufacturers move the M.2 slots to the rear where the SSD's won't get heated up by adjacent components. Just attach your own finned alloy heat sinks with thermal pads, all they need is air flow. Fins wouldn't work because then you are blocking pci lanes. This looks like the most elegant way to keep them reasonably cool while not ruining your build looks with those barebone looking m.2 drives. Don't get why anyone would oppose to this? I hate people who nitpick on things that they don't even use. Well they make waterblocks for them. They do heat up quite a bit surprisingly and throttle because of it. I have a small external SSD with mSata this guy > http://www.tweaktown.com/reviews/5835/mydigitalssd-bullet-proof-usb-3-0-msata-ssd-enclosure-adapter-review/index.html and it gets insanely hot during transfer. So I'd say I believe 100% the temperature matters with SSD's. I'd put a heatsink on M.2 SSD. I'd even bolt a 10mm (1500 rpm) fan on it to have some airflow. Hopefully this can be found on their upcoming z270 Carbon board.